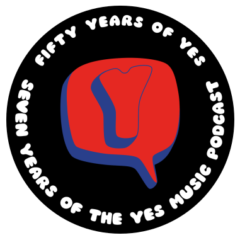 The one hundred and fourteenth episode of the Yes Music Podcast, featuring various performances of Owner of a Lonely Heart. How has this track been approached by different line-ups? What effect does Steve Howe have when he’s present? Can anyone play that Rabin solo apart from him? Listen and see if you agree with me, then get involved by contacting me via any of the methods below. As you probably know, we are planning a series of e-books covering the various stages of YES music and based around some of the Yes Music Podcast episodes. Our first publication will cover the period from Tormato in 1978 to Talk in 1994 inclusive – a sixteen year span that saw many changes in the world’s greatest progressive rock band. We are looking for contributions from YMP listeners in order to make this a community effort. If you have anecdotes, images of the band or of memorabilia for inclusion in this e-book, we would love to include them. Unfortunately, there’s a bit of information I need to give you now to make sure we all understand how we are going to run this project. The e-books will be sold and ALL proceeds will be donated to an international music charity. All material you send us must be owned by you and therefore your own copyright… this means for example that if you send us a photo, it must be YOU who took the photo and is therefore owned by you. Please avoid sending photographs of standard album covers or other standard items – try and make your contribution as unusual as possible. We also don’t want to risk annoying any of the copyright holders of those original pieces of artwork – what we are really after is photos of treasured items you have in your collection, maybe even with you in the shot – so it’s obviously not an attempt to sell Roger Dean’s or anyone else’s artwork. If you send an anecdote, make it first hand (it happened TO you or you were there when it happened and can vouch for it as a witness). The e-book will be sold under what’s called a creative commons licence, so you will need to take a look at the details of that on the website to make sure you are happy with it. This is a crowd-sourced, charity project so obviously, there will be no payment to anyone associated with these publications. Everyone involved is donating their time, materials and expertise to create, edit and format the e-book but we may have to pay fees for online facilities to sell, distribute and collect monies from the sale of the e-book. We will choose a distribution method that minimises these costs. All monies left after those costs will be donated to the chosen international music charity. We have not yet finalised the price to purchasers of the e-book but intend it to be lower than the price of a single album on a well known download site. We need to reserve the right to edit written material and to crop or edit photographic material as we see fit to ensure its appropriateness, or size, length or shape for publication. We will credit the material used in the e-book to you so please provide an exact form by which you would like to be credited in your accompanying email. Here are some examples of how you may want to format your name for publication : Kevin Mulryne, or K. Mulryne, or Kevin M, or Kevin M from Atlanta:Georgia, or K Mulryne – London, England. It’s up to you. The act of sending us the material commits you to agreeing with all of these points but does not in any way imply that we will use the material – our intention is to use as many suitable contributions as possible to make this a truly collaborative and “crowdsourced” publication. The closing date for contributions is 31st January, 2014 and we hope to be able to publish the first ebook in February 2014. We really hope you enjoy being part of an actual book about Yes as much as we enjoy putting it together. Thanks, Kevin. Yes I am aware of that recording which has its moments. I didn’t include it because of the odd line-up (i.e. arguably not a ‘real’ Yes version) but now I think it might have been a good idea. Oh well… thanks for listening. Thanks for those links, Paul – very interesting stuff there. Incidentally, nice new avatar photo! Just got the Yes box set–the Big Generator remaster sounds great…but it features a dance remix of “Love Will Find a Way” and THREE dance mixes of “Rhythm of Love.” Oh, vey! Amazing what’s in that archive! Not sure we really need all those remixes, though! Thanks for the comment. Next Next post: Get involved with the Yes Music Podcast e-book!